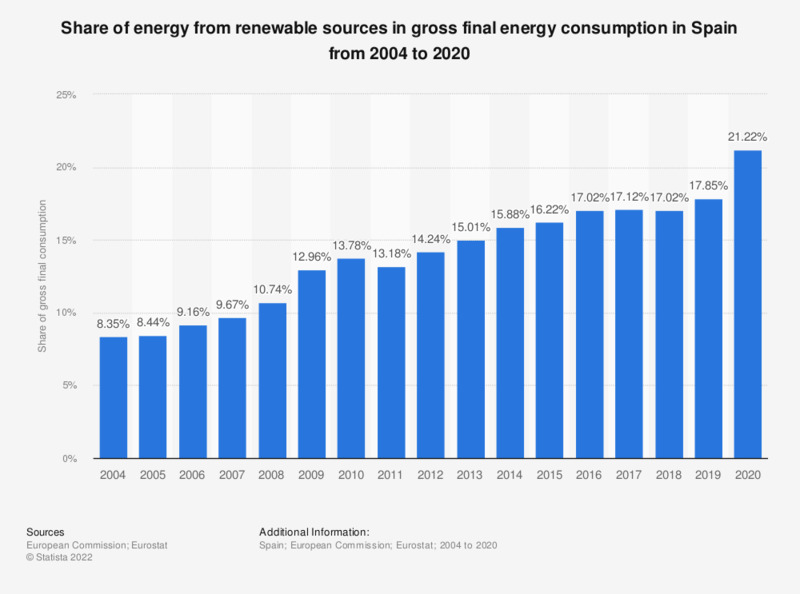 This statistic shows the proportion of energy derived from renewable sources in Spain from 2006 to 2015, as a percentage of gross final consumption. During this period the share of energy from renewable sources climbed from 9.2 percent to 16.2 percent. The source adds the following information: "This indicator is based on the definitions included in the Directive 2009/28/EC(Renewable Energy Directive) on the promotion of the use of energy from renewable sources. It is calculated on the basis of data collected in the framework of Regulation (EC) No 1099/2008 on energy statistics and complemented by specific supplementary data transmitted by national administrations to Eurostat. This indicator measures how extensive is the use of renewable energy and, by implication, the degree to which renewable fuels have substituted fossil and/or nuclear fuels and therefore contributed to the decarbonisation of the EU economy. It also show what is the progress on EU level towards Europe 2020 target for renewable energies of increasing the share of renewable energy in gross final energy consumption to 20% by 2020."